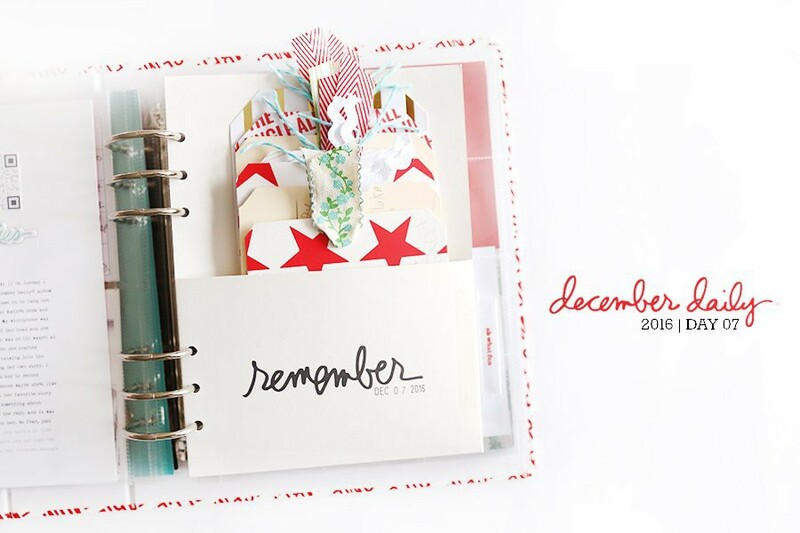 Welcome to December Daily™ 2013 | Day Five. Yesterday the kids got an email from my Mom that I just loved and knew immediately I would use it for my story/journaling today. I knew it all day until I was finally able to work on it at 9pm last night. It's not my favorite time to make stuff but once I got into it I was so happy to have the story recorded for the day (and since Simon doesn't have school today he got to stay up and keep my company). Bring on the sparkly gold! 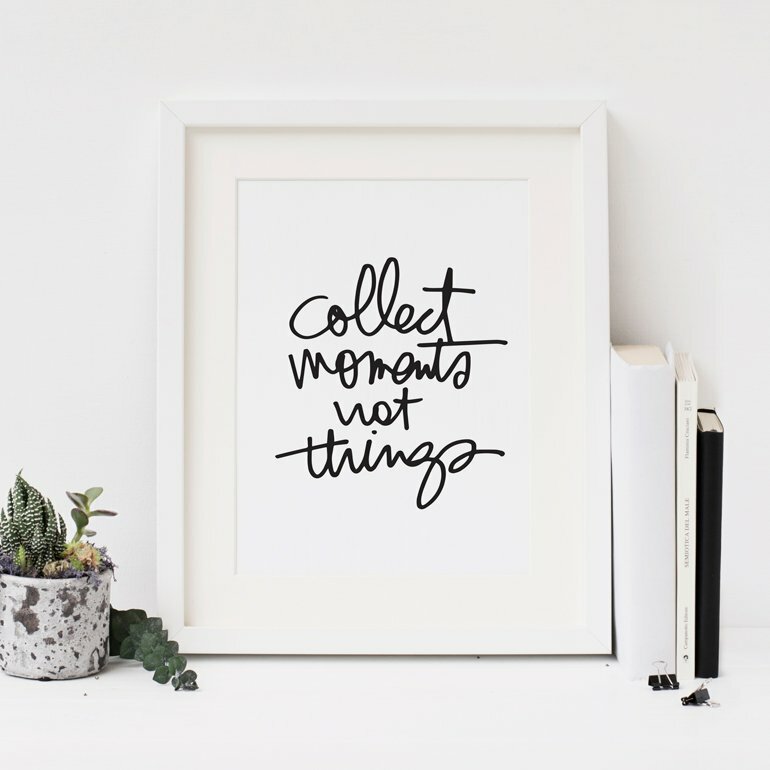 PS | I launched registration for my 2014 One Little Word workshop last night. Get all the details and register here. Day Five includes 3, 3x4 pockets and a strip of vellum for my journaling (size is 4 x 8.5). The font is Remington Noiseless. Just a shot of it outside the album. I was photographing this late at night again and it helped to take the elements out of the page protectors to reduce the glare. I liked balancing the long journaling with the photo my Mom included in the email and two decorative 3x4 cards. I love including other people's voices in my projects: emails, letters, stuff the kids write down, etc. 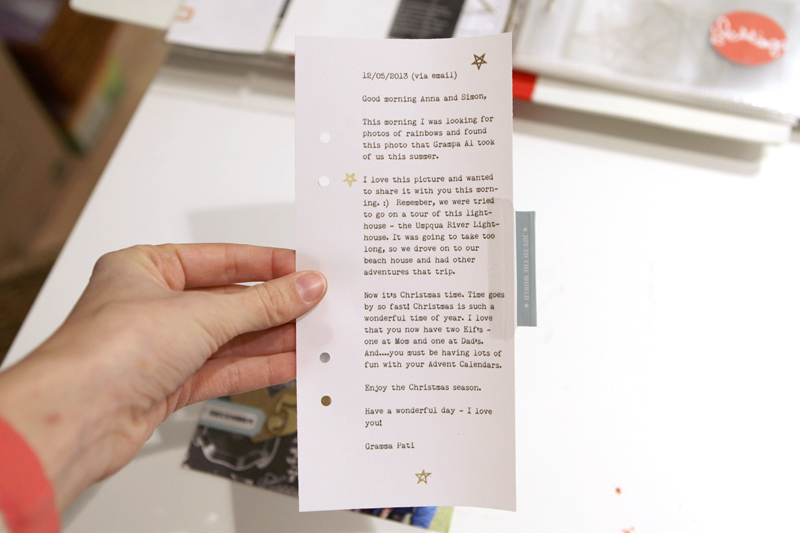 This journaling was printed on Worldwin vellum. Why vellum? Why not. 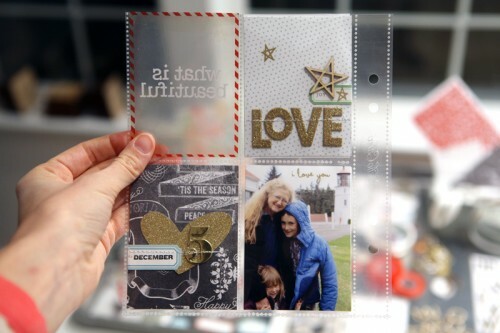 This one is not as transparent as some vellum I've used in the past but it was what I had on hand and adds a nice change in texture in the album. Along the edge I added an Avery label - partly just to counter the curl that was happening with the vellum and partly because I so love those labels. 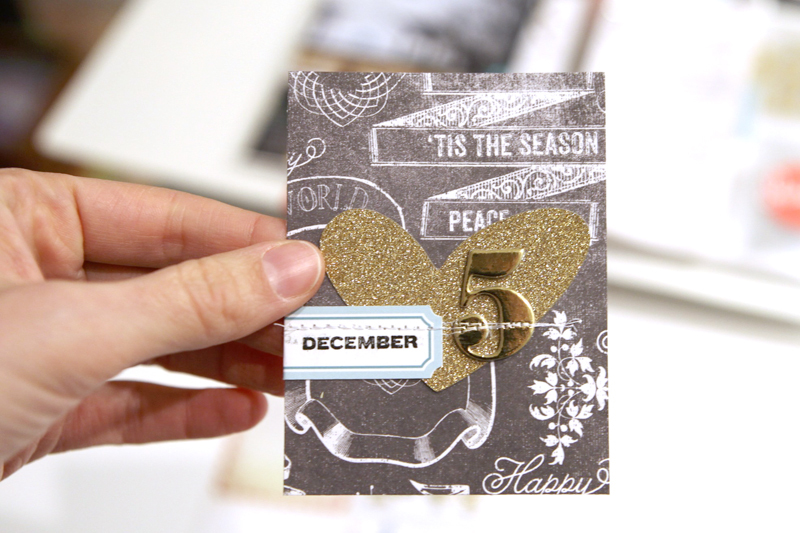 Here I used the "December" stamp from the Studio Calico kit with black Memento ink (love that ink) on top of one of the printable labels. 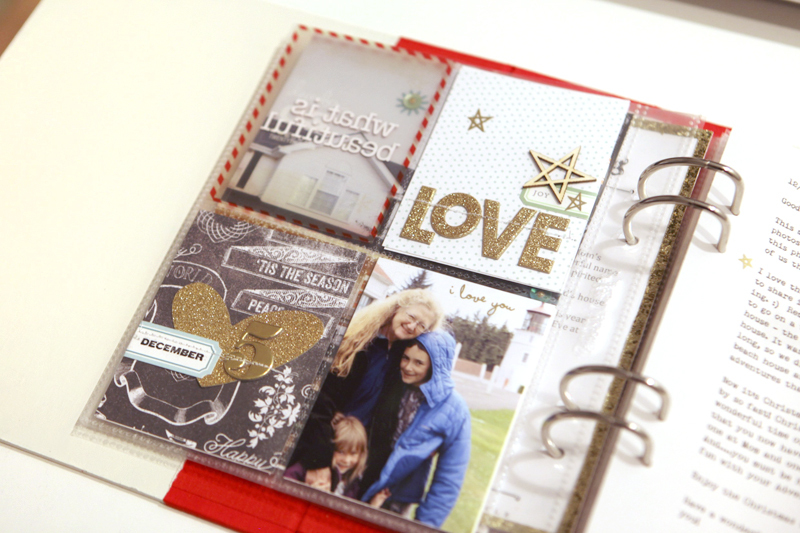 The big heart was cut from a digital file (December Daily™ 3x4 Sentiment Boxes) when I made my foundation pages - it's actually an "extra" but came in handy here. The 5 is from a set of American Crafts 25 Days Gold Foil Chipboard numbers - these don't look great on the product preview online but are awesome in person. I used my Brother sewing machine to stitch these in place. The Soul Mantra jewelry collection is filled with talismans to carry with you on your journey. From lockets with whispered messages tucked inside to "word of the year" necklaces to reminders that you are enough, you are brave, and you are loved, come along and find just the right Soul Mantra you need for yourself or a loved one. SPECIAL OFFER | Use coupon code ALI15 for 15% off your order through Sunday, December 8. Just click "Apply shop coupon code" in your shopping cart just above your total and type in ALI15. You’re invited to include a link to your DAY FIVE page here. Please link directly to your post vs. your general blog link. 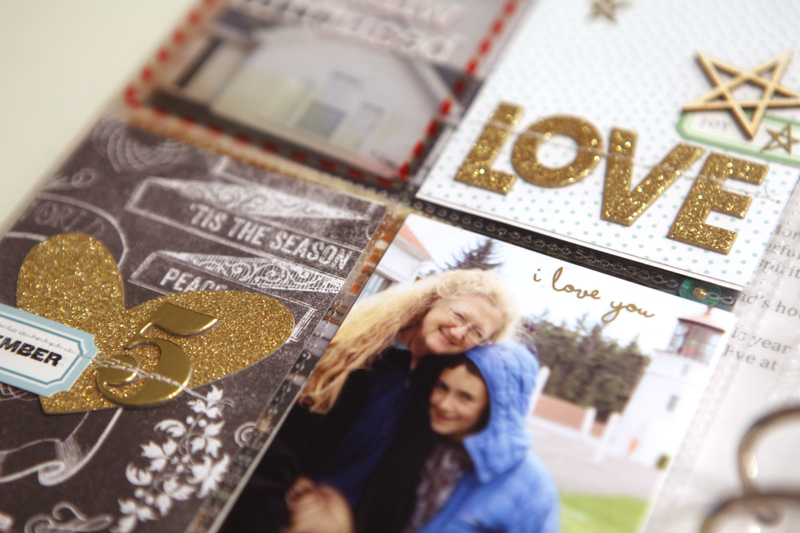 Love the stitching Ali, Yay to sparkly gold and I really like the not so transparent vellum. Yay to registration OLW 2014, going there next. I love this - epecially that the picture is not from yesterday - but is about the relationship with your kids and their Grandma. Will for sure incorporate something like this into mine as I know there will be days when I don't have great photos. Inculding stories about Grandparents, Aunts, Uncles, Cousins - such a great idea! Sadly for us---our day 5 was about the passing of our dog Buford. We had had him for 11 years and ot was really hard. I revisted your post of 'Remembering Lily' to help me cope. Thank you! Oh I'm so sorry for your loss. I know that feeling and it's hard. Peace to your family. Hi Mel - that class will be the same as it was when you took it the first time. I'm hoping to create a new list of prompts for a 31 More Things class in the future. Thanks for asking! 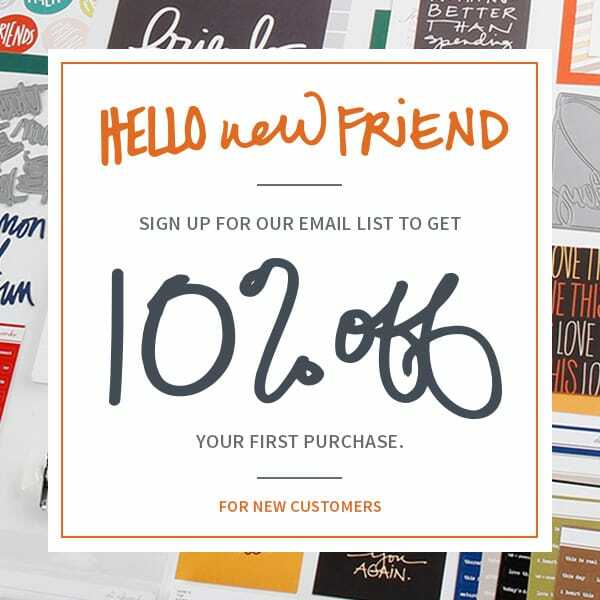 I love the idea of including your mom's e-mail in your album. Our loved ones who don't live where we do are as important as the ones who do when it comes to this wonderful time of year! 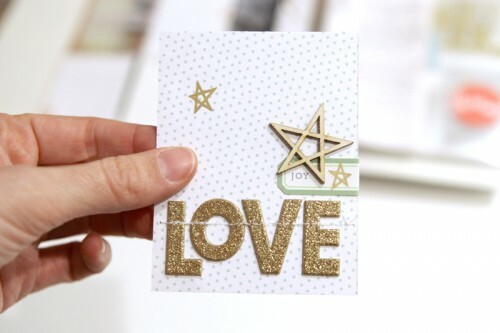 Thanks so much for the info about the Gold Foil Thickers. It can be so hard to shop for supplies when all you have is a photo that may or may not represent what the product truly looks like. This is why I hope Archiver's can survive. Their stores have all the really pretty stuff and they know how to display it so you get the full effect. Anyway, thanks for all you share! You can be my personal shopper any day! Love this Ali! 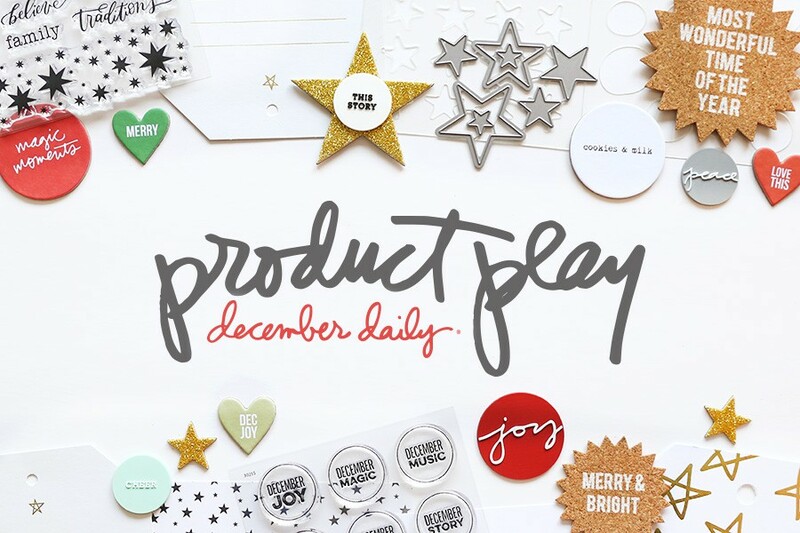 Beautiful entry for your December Daily and I'm really loving the gold touches. Love your work! Signed up for OLW 2014 last night. So excited. Fixed that - thank you! I was happy to see that you are photographing at night too! I am at work all day and I get home in darkness. That makes it tricky to photograph my pages for my blog. But you have done it successfully here! Just wondering what kind of lighting you are using to take these pictures? Is it a lamp brought close or just the lighting in your ceiling? What type of lightbulb are you using (incandescent?). I have tried various things in my studio, but have not had great success. Happy to answer! I took these shots in the little room outside my office. It has two canned lights, off to the right just a bit from the table. During the day it is an awesome space for photos because there are two big windows for natural lights and I turn off the overheads. At night I obviously have to have the overheads on so I try to shoot at an angle to avoid the glare from the page protectors or take them out. These photos were more yellow straight out of the camera. I shot them at 600 ISO (on manual and I think the shutter speed was 40 or 50 at 2.8 using a Canon 5DMKII). I used levels in Photoshop to adjust the color and make them more "white" - still not awesome but good enough for last night. Sweet story, and love that you included the email with your photos! Must be fun to see what you are going to look like 30 years down the road.....you and your mom are like twins, a generation apart! When I first glanced at this post, I thought it was a picture of you and your kids!! It wasn't until I looked closer and read the story that I realized it was your mom. You look so much alike!! Great page!! 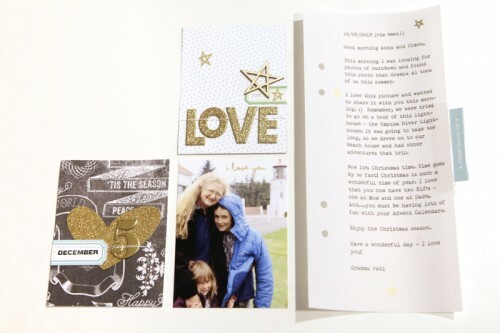 What a great idea to incorporate letters/emails from others! I received an email from my SIL about my son's adventures with her on the first - I am totally going to include that! I love the idea of including other people's voices in the album. I included a write up on my childhood Christmas traditions, and I plan to include my husband's, then something about our current traditions that we have created for our own kids. 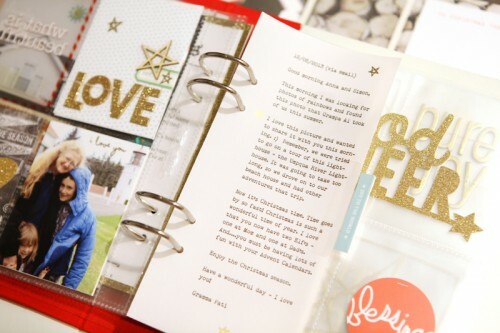 I like the gold in this page and the balanced journaling block. A lovely page Ali. I like how I don't ever know what the story is going to be for the day. I didn't have today's until I picked the children up from school, and they spent ten minutes playing in the playground with a friend, leaping in the air off of the playground equipment and throwing leaves into the air. The joy of Friday afternoon! I love everything about these pages! Love the gold incorporated into these pages! Your album is looking lovely for DD! !